Knit Faster with the Amazing Addi Turbo. Made of "Turbo" finish brass for great feel and appeal. The "Turbos" are fast, quiet, can't rust, and have soft, snag free cords. Size 000 not available in 12" or 60" length. Size 10 not available in 12". 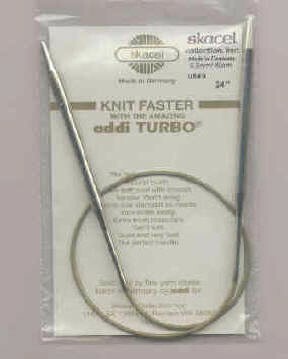 Addi Turbo needles are the best I have used. They make knitting easy and fast. I have changed all of my older needles (from other brands) to Addis over the past several years and I am not disappointed.